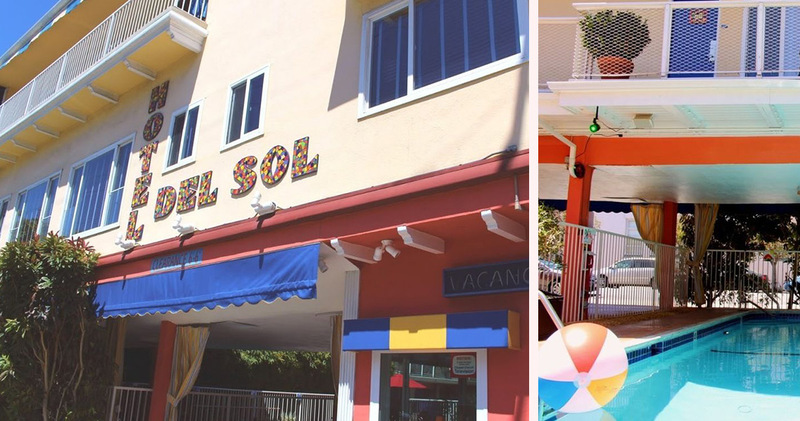 Hotel Del Sol is a fifties motor lodge redesigned as a fun boutique hotel with a beach house vibe. 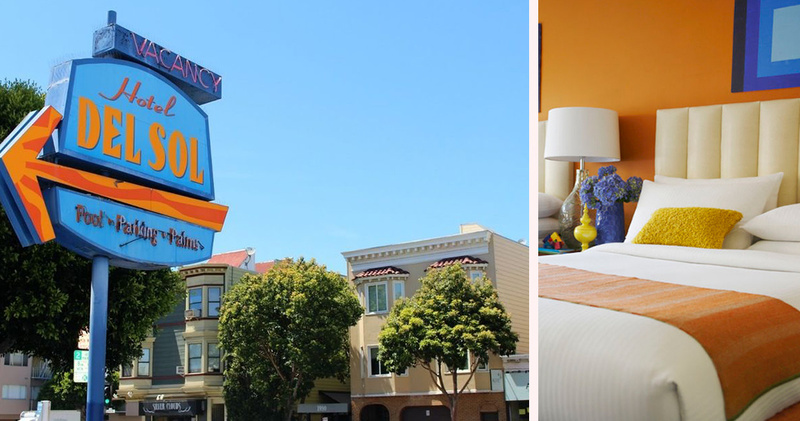 Located in the Marina neighborhood, Hotel Del Sol is close to attractions such as Fisherman’s Wharf, Fort Mason and Marina Green. 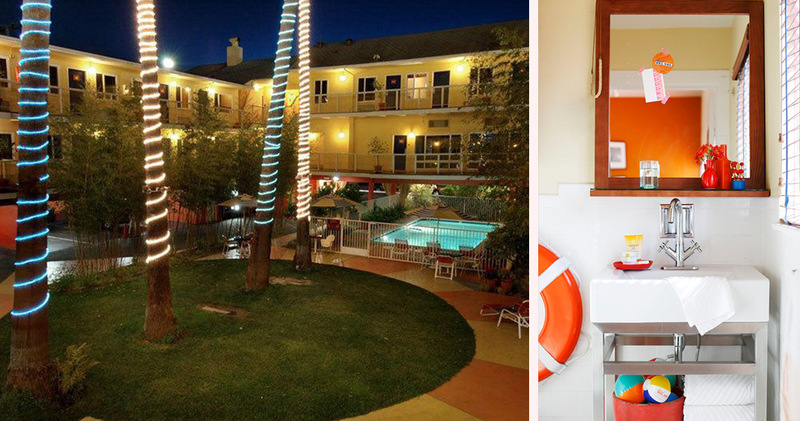 This delightful, pet-friendly hotel has a fun and quirky appeal. 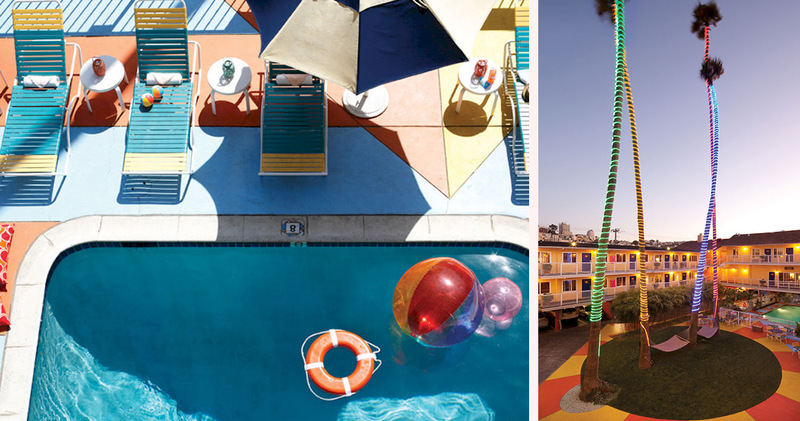 Once a fifties motor lodge, it has been renovated with colorful, playful pieces. 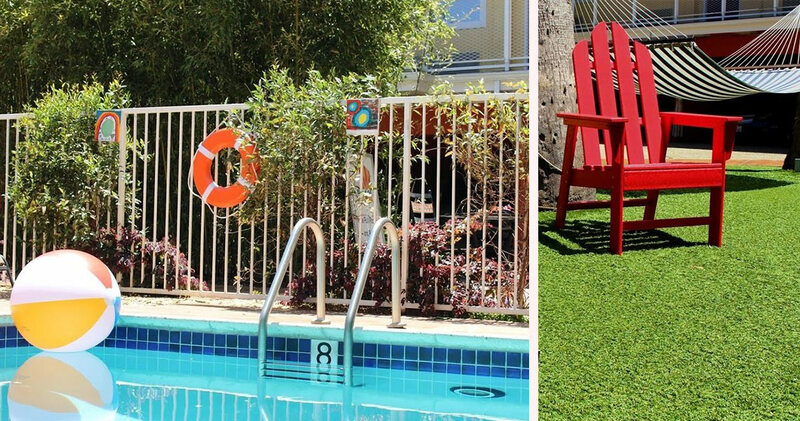 With a Californian beach house style, the hotel features lush gardens, palm trees and a saltwater pool. 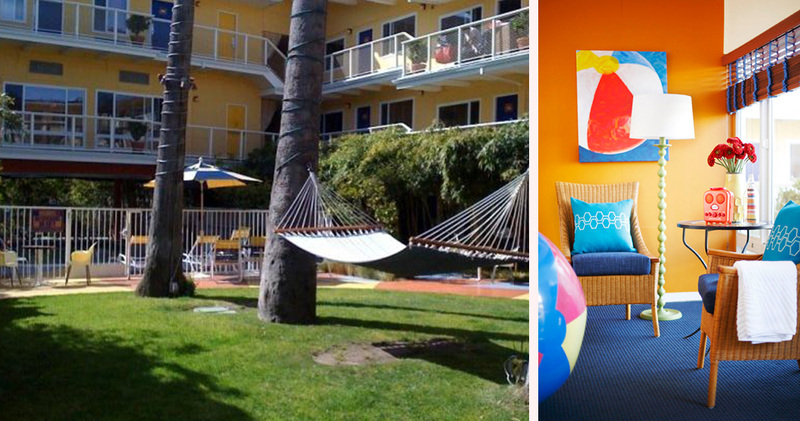 The courtyard area also has a heated pool and features colorful tiling, beach umbrellas, lounge chairs and hammocks. The lobby at Hotel Del Sol San Francisco is cozy and inviting, with colorful mosaics and brightly colored vases. The banquette in the lobby serves complimentary breakfast with a small but vibrant seating area featuring wicker chairs and a coffee table. 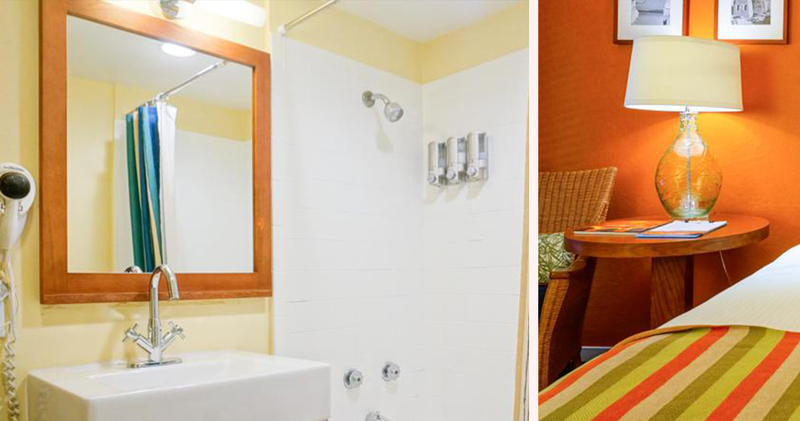 The guestrooms at Hotel Del Sol are fun, airy and bright with a retro feel. Featuring an orange and white color palette, with occasional pops of blue and yellow, the rooms are spacious and inviting. 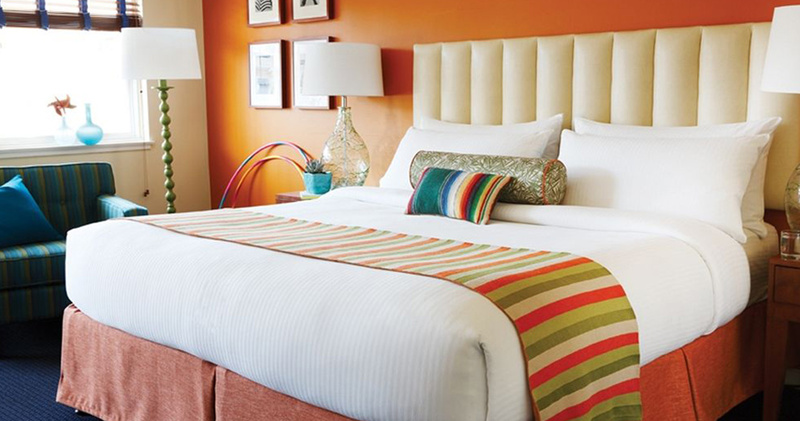 Guestrooms feature a large walk-in closet, leather headboards and artwork adorning the walls. They are thoughtfully designed with a large work desk, wicker chairs and an overstuffed chair that is great for relaxing. The well laid-out bathrooms have an appealing retro vibe, with pristine white tiling, striking artwork and wall-mounted amenity dispensers. Hotel Del Sol San Francisco uses green cleaning products for laundering linens. Hotel Del Sol offers complimentary breakfast as well as afternoon milk and cookies to guests. The hotel is also close to several good dining establishments like the Pacific Catch for fresh seafood, Delarosa for Italian cuisine and Cafe Rose for French bistro fare. The Marina is a picturesque neighborhood by the bay with hilly green spaces, plenty of restaurants and charming boutiques. The neighborhood is all about fashion and entertainment with its endless dive bars, dance clubs and trendy boutiques. Visitors will find themselves in the middle of a vibrant neighborhood with a popular farmer's market and tempting dining options like The Chestnut Bakery and The Tipsy Pig. Chestnut Street is lined with fashionable independent retailers, quirky boutiques and chain stores. The green spaces and bike paths along the waterfront provide outdoor recreation. The Marina also has several good attractions like the Palace of Fine Arts and Crissy Field.